The have re concerted this pool since we first drained it, there used to be more of a run in the shallow end. Was a super fun spot when it was bigger. That a Perth one GP? Might be some trannie in the deep lurking beneath the water? that looks like a beauty GP, got any pics of it being ripped? That's shame, good to here it's still going though. Was a fun little pool. maybe a pretty good pool in Broome but pics are average! Anyway, crew smashing it up. 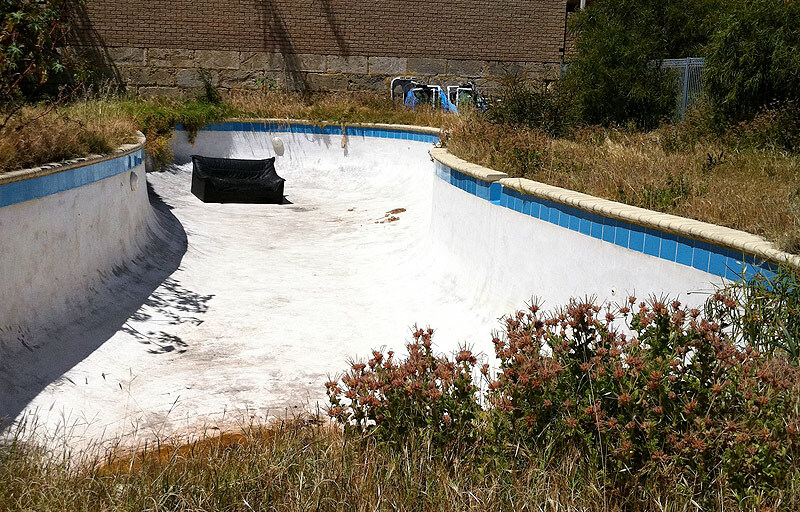 Saw that pool on adairs blog on slam site. Looks good. Is tortise still skate able?i'm in wa town from dec29th .and hanging to skate. Speak soon,heard been hot over there lately. what we have here is a skateable right hand kidney with generous transitions and a steep waterfall. situated in an empty lot and relatively bust-free. being CLEANED AND SKATED this afternoon from 5pm. I know the scum don't mind jumping into the odd pool, so reply to this if you want in. all pertinent details (apart from how much fun it is) will be delivered in pm format. need to login to the scum site on Friday afternoons from this point on.